The gridlock-relieving rapid transit project is a world's first. May 22, 2017, 9:42 a.m.
As if it weren’t enough for the state of Washington to claim bragging rights as the self-described “floating bridge capital of the world,” transportation officials are beginning preparations to top one of these iconic pontoon-supported spans with a light rail line. When complete, this huge — in both ambition and innovation — mass transit project will carry Sound Transit's upcoming East Link Extension light rail line across Lake Washington, connecting Seattle to the cities of Bellevue and Redmond along with other well-heeled suburbs located on the lake's eastern shores. A city wedged in between two large bodies of water, Seattle is home to three of the world’s five longest floating bridges. All of them span Lake Washington, a freshwater ribbon lake that, along with the Puget Sound to the west, gives Seattle its isthmian character. It’s the shortest (but also the widest) of Seattle's floating bridges — the Homer M. Hadley Memorial Bridge — that, by 2023, will be home to the world's first-ever floating light rail line. The rail line itself will replace the bridge’s two reversible HOV “express” lanes that carry traffic westbound, toward Seattle, in the morning and eastbound, away from the city, in the evening. For state transportation officials, the decision to do away with Homer M. Hadley Memorial Bridge’s HOV lanes and replace them with train tracks was something of a no-brainer. For one, building the $3.7 billion East Link to go around Lake Washington was never an option — from a mass transit prospective, circumventing the 22-mile-long lake instead of directly connecting Bellevue with Seattle just didn’t make sense. Carrying the rail line across Lake Washington on a fixed bridge was also a no-go given that the lake is simply too deep to erect columns that could support a conventional bridge. The glacier-carved lake's deepness —110 feet deep on average — is the reason why Lake Washington has floating bridges instead of fixed bridges to begin with. This is also why an underwater tunnel simply wouldn’t work. While not entirely impossible, constructing a rail-only floating bridge across Lake Washington would have been tricky from an engineering standpoint and also prohibitively expensive. “It’s cheaper to do the rail and road bridges together than to separate them,” John Marchione, Redmond mayor and longtime transit board member, recently explained to the Seattle Times. Issues of lake deepness and cost aside, state transit officials also didn’t have much of a choice to not build the new rail line atop of the Homer M. Hadley Memorial Bridge. Although the remarkably wide span was built strong enough to accommodate rail in addition to several lanes of interstate traffic, concerns over load capacity forced the mass-transit aspect to the back burner. Now, after decades of bureaucratic hand wringing, one real estate developer-backed lawsuit and countless rounds of structural testing, that pact made over 40 years ago is finally being honored. As Sound Transit explains, engineers had to consider six ranges of motion that impact the floating bridge — up and down, back and forth and side to side — while demonstrating that it was absolutely safe to add a pair of 300-ton trains, each moving at up to 55 miles per hour, into the equation. The most difficult task is adapting the rails to the movements of the bridge. Train tracks will cross the hinges and sloping spans between the bridge’s fixed sections and the 1-mile floating deck, like someone walking down the gangway to a boat marina. Lake levels rise and fall two feet a year. Waves, wind and traffic create slight twisting. A full train is heavy enough to plunge the pontoons eight inches. So the railbed must both resist and absorb roll, pitch and yaw. Failure is not an option. A derailed train could sink 200 feet to the lake bed. If track components break or wear out, transit service would be halted for maintenance, or subjected to slowdowns. Speaking to the Times, John Stanton, professor of civil engineering at the University of Washington, praises the engineering team's "brilliant solution" that places the railway atop a series of eight 43-foot-long “track bridges” positioned above the hinges where the fixed and floating sections of the bridge meet. Composed of steel plates and high-strength "pivoting" bearings, the technology is the same kind that allows buildings and fixed bridges to flex during earthquakes. With these specialized track bridges, which were relentlessly tested at the Transportation Technology Center in Pueblo, Colorado, trains can cross Lake Washington comfortably at full speed even while the floating bridge deck underneath sways a wee bit to and fro. What’s more, ballast gravel will be removed from the bridge’s hulking, watertight concrete pontoons to ensure buoyancy and so that the addition of commuter trains don’t throw the bridge off balance. In a last-minute design addition, steel frames will be built within the pontoons, so that cables can be pulled through lengthwise. When force is applied at the bridge ends, that should tighten the concrete in the midsections of the pontoons. The goal is to prevent microcracks and assure the 100-year life span of the structure. Before the trains begin carrying commuters, Sound Transit will run them sans passengers for three months to accurately record track movements. During high winds, train service will be reduced and, in rare cases, temporarily shuttered altogether. “About once a year we may only allow one train per direction, and about once a decade we may have to cease operations on the bridge until the wind dies down,” Sleavin tells Q13. Construction of East Link across Lake Washington is not expected to impact the Homer M. Hadley Memorial Bridge’s scenic bike/pedestrian lanes, which are part of the I-90 Mountains to Sound Greenway Trail. While there’s much more that can be discussed on the technical side (and Times transportation reporter Mike Lindblom does a fantastic job at this), it’s also worth focusing on the impact that connecting Seattle with the Eastside will have on commuters in this congestion-plagued metro area. Once complete, the 14-mile East Link Extension will ferry commuters from downtown Seattle’s International District/Chinatown to Bellevue, an affluent Eastside satellite city, in just 15 minutes. A ride on East Link from the University of Washington, north of downtown Seattle, to Mercer Island is expected to take 20 minutes. Sound Transit anticipates 50,000 daily riders will hop on East Link for a quick, reliable and headache-free commute — that's a whole lot less cars on the road in a sprawling, historically car-dependent town that recently ranked 10th worst in the nation based on time spent sitting in traffic. Trains departing from the line's western terminus at International District/Chinatown station — this downtown transit hub is an existing stop on the north-south Central Link line and will serve as a major transfer station — will run parallel with I-90 through the Mount Baker Tunnel, across the Homer M. Hadley Memorial Bridge and beneath Mercer Island’s Aubrey Davis Park, an innovative freeway lid park that covers a portion of the interstate as it passes through the largely residential island. Exiting Mercer Island, trains will then cross the East Channel Bridge, a short fixed bridge that spans Lake Washington’s tech millionaire mansion-lined East Channel. From there, East Link veers away from I-90 and heads north toward downtown Bellevue and the line’s eastern terminus at Overlake, an area just south of downtown Redmond. The first phase of Sound Transit's East Link Extension will include 11 stations, many with park and ride facilities. Eventually, it will expand even further northward to downtown Redmond. The 4.3-mile Northgate Link Extension, which expands Central Link from the University of Washington to Seattle's northern patchwork of neighborhoods, is also under construction with an anticipated opening in 2021. In the final planning stages are two additional Central Link extensions, both slated to open in 2023 — the same year that East Link Extension and its game-changing Lake Washington crossing will be up and running. One sees Central Link climb north from north Seattle to the cities of Shoreline and Lynnwood while a southern extension will service commuters in the cities of Kent, Des Moines and Federal Way. What's more, early this spring Sound Transit announced plans to power its growing light rail system with 100 percent wind energy starting in 2019. Albeit smaller, Sound Transit's wind-powered rail scheme is similar to one that the Dutch government announced in 2015. Rail stations, it turns out, are delivering much more than passengers to surrounding neighborhoods. 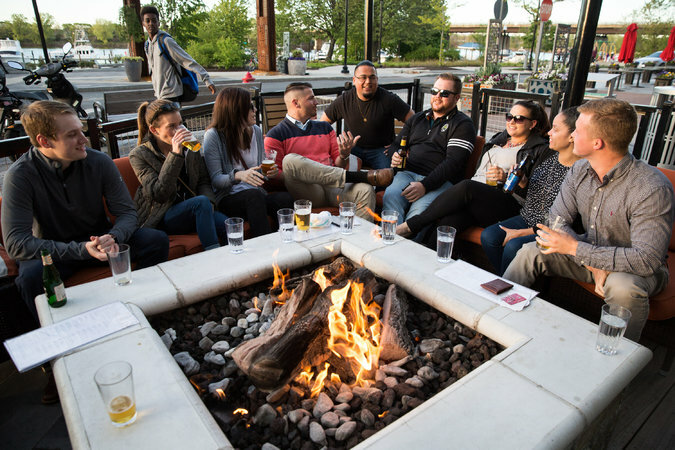 Young workers who prefer to walk or take the train — rather than drive — to eat, work and shop are pushing up property values and reshaping the way developers approach their plans. Few places make this shift more evident than the Somerville suburb of Boston. 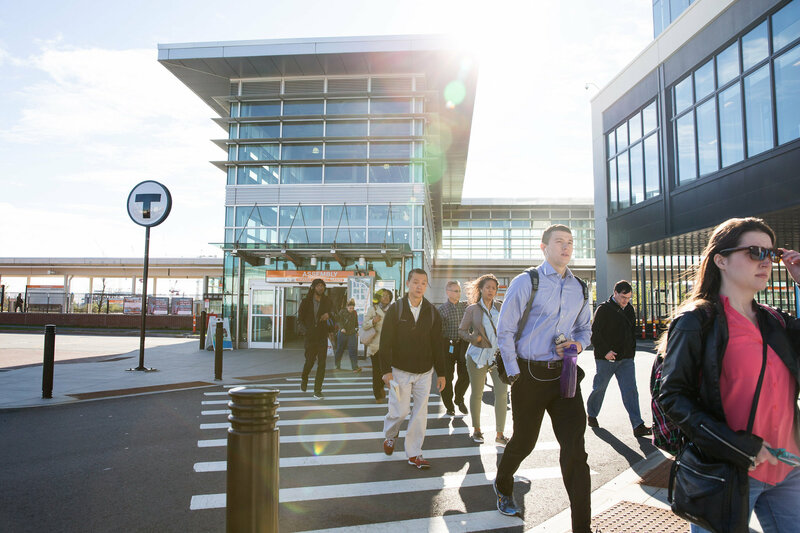 A new Massachusetts Bay Transportation Authority subway station was crucial to bringing Partners HealthCare to a new 825,000-square-foot office building at the Assembly Row complex last year, said Chris Weilminster, the president for the mixed-use division of the developer Federal Realty Investment Trust. 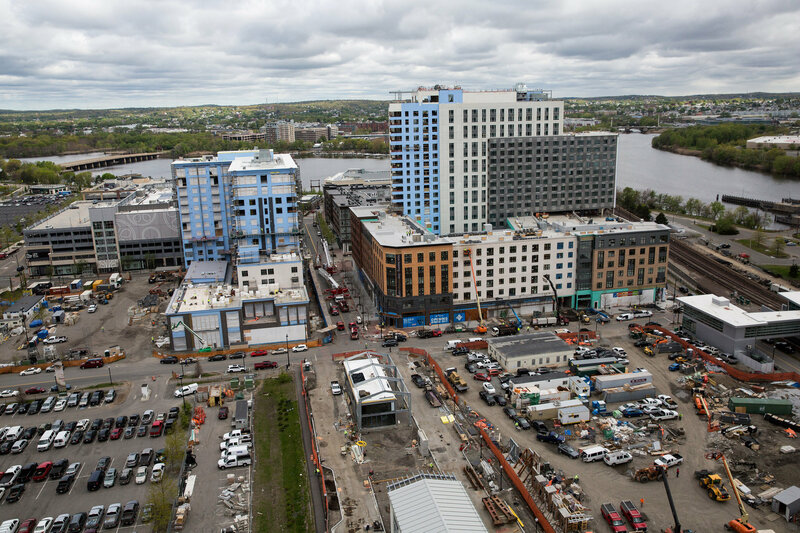 The station, which opened in 2014, has also driven Federal Realty’s broader development of Assembly Row, which broke ground in 2012. The trust has transformed a 45-acre industrial site — a barren expanse of broken concrete and scrub — into a neighborhood where housing, offices and restaurants rub shoulders along streets intended to be inviting to pedestrians. Public spaces throughout the development bump up against the Mystic River shoreline. A second, $280 million phase will add commercial space and homes, including condominiums on top of a boutique hotel. Putting a commercial development near a rail station also reduces the need to build parking, which can be costly. And even millennials who do not use the train may not require a parking space; many are indifferent toward car ownership, particularly given the rise of taxi and car service technologies like Uber and Zipcar. Such trends give transit-oriented developments an edge over traditional suburban office parks when companies are searching for space, real estate experts say. The growing number of transit-oriented developments has spurred rail projects in markets of all sizes. Areas that have experienced development near new rail systems or station openings include Fulton Market in Chicago; downtown Kansas City, Mo. ; Austin, Tex. ; and the RiNo neighborhood of Denver, to name a few. Office buildings with access to transit are outshining those without, fetching rents nearly 80 percent higher. That amounts to $45.57 a square foot versus $25.39 a square foot, according to a report released this year by Jones Lang LaSalle. Those same buildings have a vacancy rate 3.7 percentage points lower than offices without transit access. “It’s definitely a factor when tenants are making their final choice,” said E. Nelson Mills, the chief executive of Columbia Property Trust, a New York-based landlord that owns about 7.8 million square feet of office space, primarily in New York, San Francisco and Washington. A case in point is Columbia Property’s $3 million renovation of the 80 M Street building near the Navy Yard-Ballpark Metrorail station in Washington’s fast-growing Capitol Riverfront neighborhood. The upgrade follows about 84,000 square feet of new leases, including a 15-year, 68,673-square-foot deal with the shared and private office provider WeWork. The Washington Metropolitan Airports Authority is extending a 23-mile Metrorail line into Northern Virginia to connect downtown Washington to Dulles International Airport and beyond. The first part of a two-phase expansion included four station openings in 2014 in the Tysons Corner suburb, which has numerous office buildings. Since the end of 2012, the average office rental rate has climbed 10.5 percent there, compared with a decline of 4.5 percent in neighboring Merrifield, according to Jones Lang LaSalle. Just to the east, in Herndon, Va., MRP Realty bought eight office buildings on 32 acres from Liberty Property Trust last year, for $97 million. The office park is near the future Innovation Center Metrorail station, projected to open in 2020. MRP Realty is renovating three buildings and it plans to tear down smaller, out-of-the way office properties to make way for townhouses, apartments and retail space. 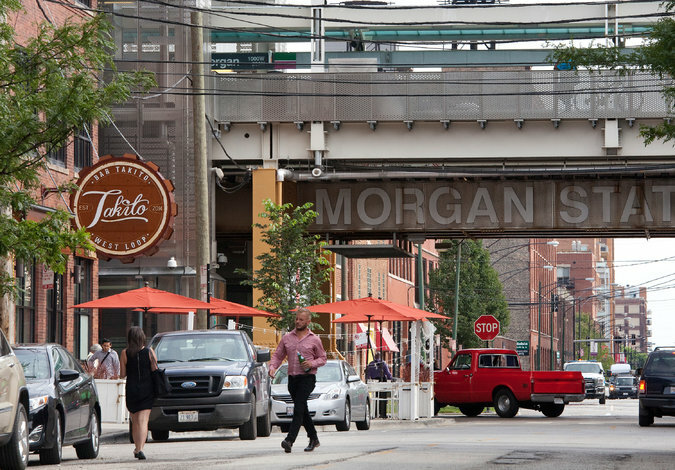 The industrial Fulton Market neighborhood in the West Loop of Chicago began developing a reputation as a vibrant residential, restaurant and bar scene about a decade ago. But investment in the area accelerated when the Chicago Transit Authority said it would open an elevated train station along an existing line in 2012. Developers swooped in to add offices in new and rehabilitated buildings. Google and Uber are among the companies that have moved into the neighborhood over the past several months, and McDonald’s announced last year that it would move its headquarters there from the suburb of Oak Brook. Corporations in the Northwest are also gravitating to submarkets served by transit. 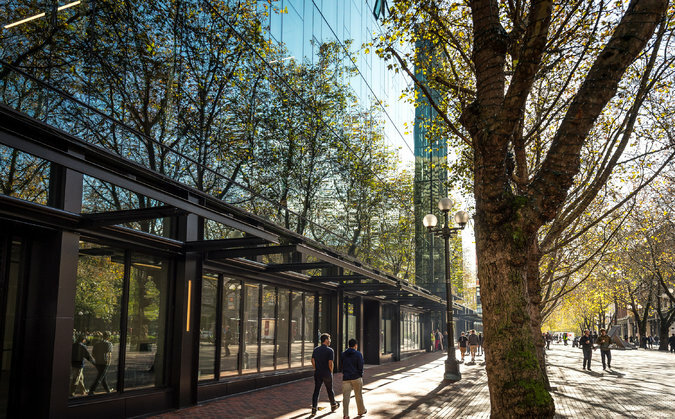 In September, Weyerhaeuser, a timberlands company, traded its 425-acre campus in a Seattle suburb for a new building downtown that is three blocks from a transportation hub. Citing transit opportunities, the outdoor-gear retailer REI also announced that it would move into new headquarters in the growing, mixed-used Spring District of Bellevue, Wash., in 2020, just a few years before a Sound Transit light rail station opens there. Bert Gregory, a partner with the architecture firm Mithun, which designed the new Weyerhaeuser headquarters and is working on apartments in the Spring District, recalled a conversation a few years ago in which a developer told him that rail stops had replaced intersecting freeways as “100 percent” sure-to-succeed locations. Noting the developer’s prescience, Mr. Gregory said he had recently realized that all of his active projects were within two blocks of transit lines. One of those includes turning the site of The Oregonian’s former printing press buildings into housing, as part of a mixed-used project just outside downtown Portland. “Transit is the nature of development interest and of developer focus today,” he said. 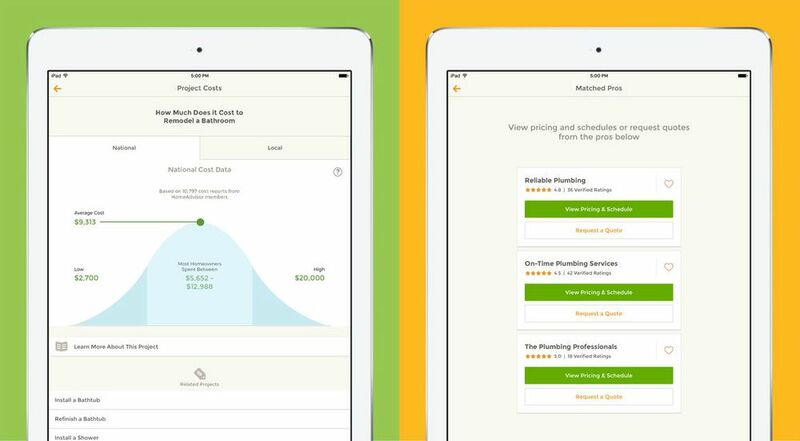 Whatever home improvement job, there's probably an app out there that will help. 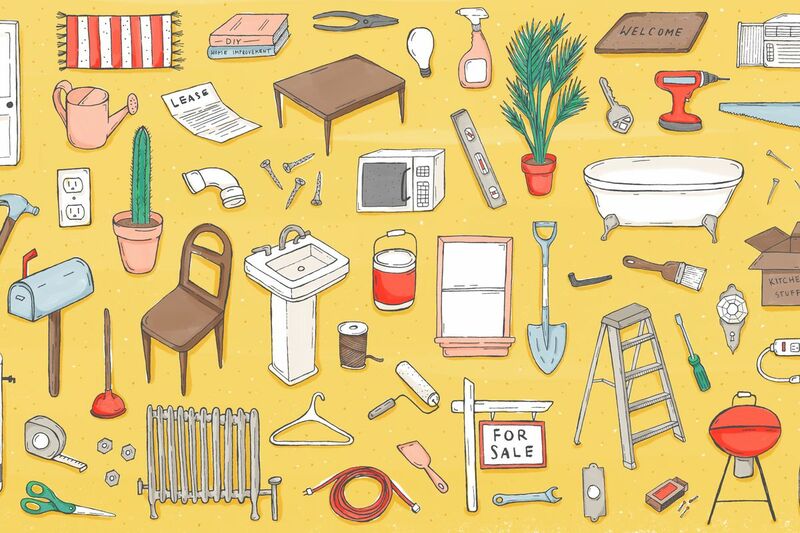 Everything you need to know about owning or renting a home, including expert advice on painting your living room, renovating a historic home, getting mortgage, and so much more. Embarking on a home renovation project is no easy feat, but thanks to today's advances in internet technology, there is probably a stellar app out there ready to assist with every part of the process. Below, we rounded up 15 standouts across three categories—plan, design, and expert help—available on iOS and/or Android, many of which are free to download. 2. Roomscan Pro: For creating floor plans just by touching your phone to each wall. 3. 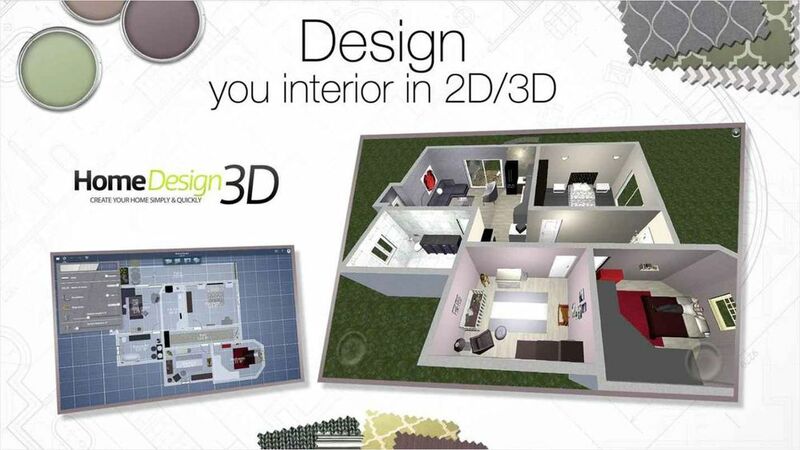 MagicPlan: For creating floor plans from photos of a room. 4. 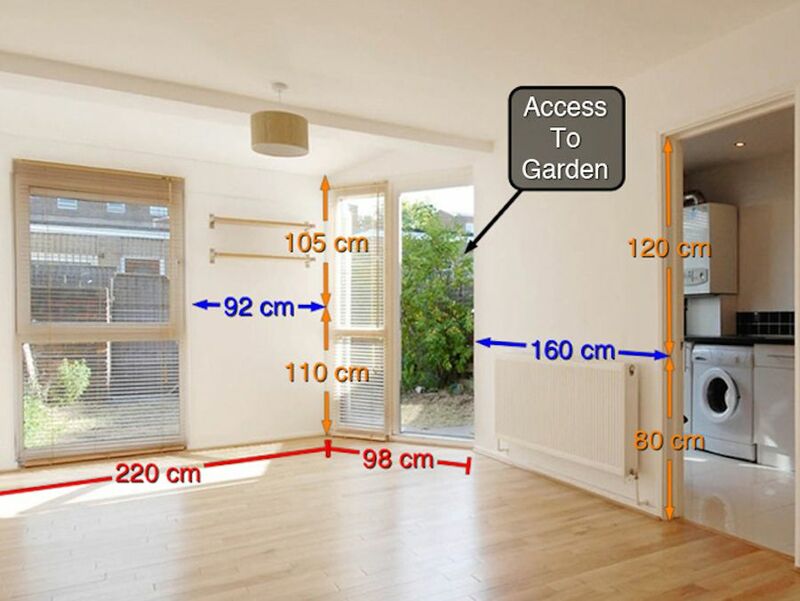 Photo Measures: For saving measurements directly on your own photos. 5. Handymobi: For organizing home improvement projects, browsing and sharing DIY project ideas; a free toolbox includes a unit converter, level tool, and calculator. 6. 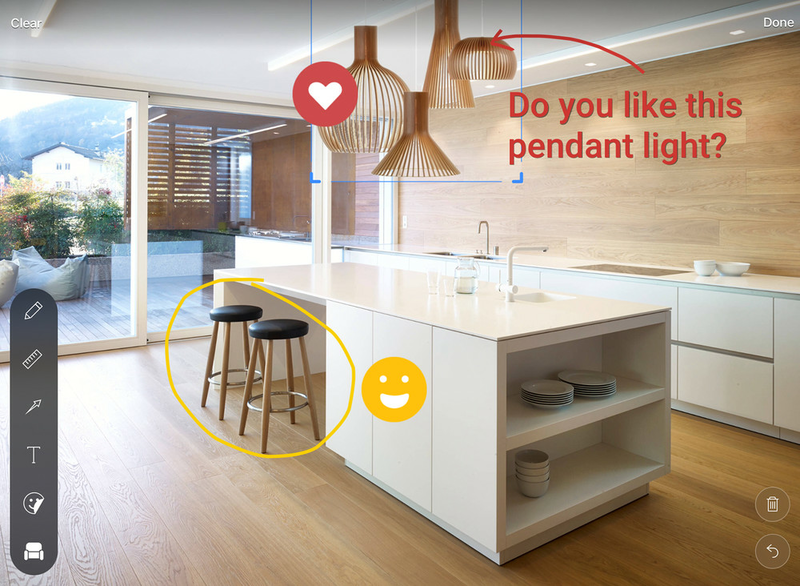 Tap Painter: For visualizing paint colors (from major brands like Benjamin Moore, Behr, Sherwin Williams, and more) on interior spaces. 9. Chairish: For buying and selling pre-loved home decor, vintage furniture, art, and more; a “preview” feature lets you see items in your space. 10. Zillow Digs: For even more interior design ideas and project estimates. 11. Hutch: For virtually trying out curated decor styles in your space just by taking a photo. 12. HomeAdvisor: For discovering and comparing contractors and instant bookings. 13. Smith: Home Remodel, Improvement & Repairs: For getting multiple bids from pre-screened contractors within 24 hours. 14. Thumbtack: For recommendations on contractors for all sorts of home-related jobs. 15. Havenly: For working with a professional interior designer on your project; chat with a designer for free or book a custom project starting at $79.